Prepare the red, blue, and clear gelatin according to the Jello Jigglers™ recipe (found on the Jello® boxes). Pour about 1/2 inch (1.25 centimeters) of blue gelatin into a round Petri dish. Pour about 1/2 in (1.25 cm) of red gelatin into a round Petri dish and 1/2 in (1.25 cm) into a square container. Pour about 1/2 in (1.25 cm) of clear gelatin into a square container. Shine the green laser through the round dish of blue jello and observe the beam as it travels through the jello. Shine the green laser through the red jello and notice that the beam gets dimmer as soon as it enters the jello. 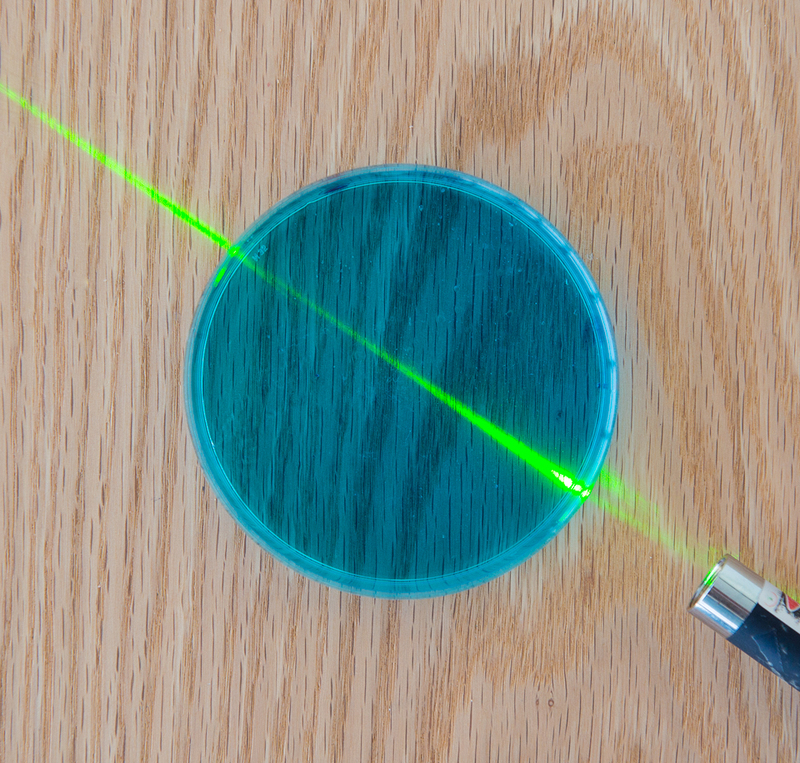 Hold the laser parallel to the table and shine it through one side of a square dish of red or clear gelatin. (Use the red laser for the red gelatin; use either the green or red laser for the clear gelatin.) Start with the beam perpendicular to the edge; notice that it passes through the gelatin in a straight line. Now rotate the laser so that the beam hits the flat edge of the dish at an angle. As you do so, notice how the beam bends towards the center of the dish. Use the protractor to measure the angle of incidence between the beam and a line perpendicular to the flat edge, and the angle of refraction after it enters the gelatin. Finally, take a square dish of red or clear gelatin. Holding either laser parallel to the table (use the red laser for the red gelatin; use either the red or the green for the clear gelatin), shine the beam through one edge of the box and notice the beam coming out the far side. Now, shine the beam through one side of the box so that it hits the adjacent side at a glancing angle—you'll notice that no light exits the box through that side! (You may need to play around a bit to find the right glancing angle.) The largest angle at which no light escapes is called the critical angle. Gelatin is colloidal—its large molecules are suspended in solution in such a way that they don't settle out—and so it scatters enough of the laser beam to make it visible. Red dye in the red gelatin doesn't absorb red light, so you can see the red beam when it shines through it. The blue gelatin (which is actually cyan) absorbs red light (but not blue or green), so the red beam isn't visible. As light enters the gelatin, the change in medium causes a change in the speed of the light and a change in the index of refraction. This change in speed causes the direction of the beam to refract, or bend. When going from a high-speed material such as air to a lower-speed material such as gelatin, the beam will bend into, or towards, the gelatin. As light travels from a slower (or more optically dense) substance to a faster medium, it may reflect in a similar way to the skimming of a stone off the surface of water. If the beam hits at an angle that is small relative to the surface, then the light will completely reflect—this is called total internal reflection. If the angle is closer to perpendicular, then the beam will exit out the side of the dish. As it moves from a higher-speed medium to a lower-speed one, a ray of light will behave similarly to the way a car behaves as it moves from paved asphalt to soft dirt or loose gravel. The car will change direction by angling into the gravel, the same way a beam of light will refract by turning in a similar direction towards the lower-speed material.